12/31/17 7:16 p.m. -- A timeline behind the unrest in Iran. 12/31/17 7:03 p.m. -- Alex Vatanka, senior fellow at the Middle East Institute, told VOA's United Nations correspondent Margaret Besheer that the Iran protesters are being driven by socio-economic grievances. On the role of social media, it's "certainly a concern to the authorities, but we don’t really know what exact contributing factor it was in terms of that mobilization. … I would say it’s a factor, but it’s too early to say how big of a role it played," he says. On Iran's youth: “When you look at the footage coming out Iran, is young people -- many of them were born 20 years after the revolution of 1979, they have no sense of what it is this regime does that reflects what they want. They have no historic memory of 1979, what was there before 1979, they don't have any memory of the Iran-Iraq war -- all they know is that they go to university, they work hard to get an education or do whatever it is to lift themselves up in life and there are so many different obstacles in their path," Vatanka tells VOA. 12/31/17 6:28 p.m. -- Photo gallery of demonstrations on Saturday and Sunday in Iran. 12/31/17 5:45 p.m. -- VOA Persian Division Director Setareh Derakhshesh got exclusive comments from senior U.S. official Michael Anton, deputy assistant to the president for strategic communications, on the latest developments in Iran on Sunday. Story to come. People protest in Tehran, Iran Dec. 30, 2017, in this still image from a video obtained by Reuters. 12/31/17 5:15 p.m. -- President Trump Tweets: "Iran, the Number One State of Sponsored Terror with numerous violations of Human Rights occurring on an hourly basis, has now closed down the Internet so that peaceful demonstrators cannot communicate. Not good!" 12/31/17 5 p.m. -- Social media reports show clashes between protestors and police in Hamadan. There are no reports of casualties on Sunday. 12/31/17 4:46 p.m. -- Photos sent to VOA Persian show protests in the port town of Chabahar in Sistan and Baloochistan province. 12/31/17 4:20 p.m. -- Since protests began on Thursday, several hundred protesters have been arrested, AP is reported. 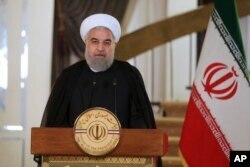 -- Iranian President Hassan Rouhani said Sunday his people have the right to protest and criticize the government, in his first public response to nationwide anti-establishment protests that have stretched into a fourth day. -- At least two protesters were killed in clashes between anti-government demonstrators and police in the western town of Dorud. -- The protests, which began on Thursday, initially appeared to be a reaction to high food prices and unemployment. But they quickly evolved into expressions of anger against Iran's clerical leadership, including President Rouhani, who won re-election in May with promises to revive the economy. -- The United States has condemned the arrest of protesters, with President Donald Trump cheering on the protesters via Twitter. Trump tweeted on December 31 that it looks like the Iranians "will not take it any longer," adding, "The USA is watching very closely for human rights violations!" 12/31/17 4 p.m. -- Iran president Rouhani will hold a joint meeting with heads of parliament commissions on Monday to address the country’s economic issues. An MP says this was planned prior to IranProtests. 12/31/17 3:45 p.m. -- Middle class Iranian woman in Tehran tells RFE/RL's Golnaz Esfandiari that many are worried the protests would turn Iran into "another Syria" or that people would get killed and that there won't be any meaningful changes. "We want democracy but no violence." Protesters in Tehran's Valiasr avenue overturned a police car. ​12/31/17 2:54 p.m. -- Follow Radio Free Europe/Radio Liberty's coverage of protests in Iran. 12/31/17 2:45 p.m. -- The unrest rippled through Iran’s stock exchange. The TEDPIX Index fell 1.7 percent to 95,561.58 in Tehran on Sunday, the lowest level since Dec. 20, according to data on the bourse’s website. 12/31/17 1:30 p.m. -- Protestors overturn police van in Valiasr Street on the fourth day of protests.A protestor is heard shouting, "Knock it over! Knock it over!" 12/31/17 12:45 pm -- Iranian President Hassan Rouhani, in his first comments since days of anti-government demonstrations broke out, said people have the right to protest but stressed violence is not acceptable. FILE - In this photo released by the office of President Hassan Rouhani addresses the nation, in Tehran, Iran, Oct. 13, 2017. "Criticism is different to violence and destroying public property," he told a Cabinet meeting, according to state media. 12/31/17 11:50am -- Iran's semi-official ILNA news agency is reporting that police arrested around 200 protesters in the capital Tehran on Saturday. 12/3117 11:45am -- Anti-government protests continued for a 4th day in Iran. Pictures posted on the VOA Farsi twitter feed show some scattered demonstrations in Tehran and families of arrested protesters gathering outside Evin prison. 12/31/17 11:43am -- U.S Ambassador to the U.N. Nikki Haley issued a statement on the protests in Iran. "In the New Year, our hopes and prayers are with the millions of people who are suffering terribly from oppressive governments in North Korea, Venezuela, Cuba, and especially in Iran, where the long-repressed Iranian people are now finding their voice. The Iranian government is being tested by its own citizens. We pray that freedom and human rights will carry the day," she said. 12/31/17 11:00am -- Iran temporarily blocked Instagram and messaging app Telegram on Sunday to "maintain peace" amid growing demonstrations, state television said. Many protesters had been using the apps to upload or share photos and videos from demonstrations. 12/31/17 10:30am -- Telegram's CEO said Sunday on Twitter that the app had been blocked after management refused to heed a government request to shut it down. 12/31/17 - 8:30am -- President Donald Trump tweeted about the protests, saying "The USA is watching very closely for human rights violations." 12/31/17 7:00am -- An Iranian official blamed "foreign agents" for the shooting deaths of two protesters on Saturday. The shootings happened in the western town of Dorud on the third day of protests. VOA’s Persian service identified the victims as Hamzeh Lashni and Hossein Reshno after a reporter spoke to the victims’ families. 12/31/17 1:00am -- Iran's interior minister warned that those who "disrupt the order and break the law must be responsible for their behavior and pay the price." Abdolrahman Rahmani Fazli, in a statement on state television, said "fear and terror will definitely be confronted." 12/30/17 -- Videos posted to social media seemed to show thousands of people protesting in several cities throughout Iran. Saturday's demonstrations were the largest and the most serious challenge to Iranian authorities since 2009. 12/30/17 -- President Donald Trump denounced the Iranian government Saturday, tweeting excerpts from his September 19 speech to the U.N. General Assembly. He charged Rouhani's government, and those before it, have long oppressed the Iranian people. 12/30/17 -- Separate state-sponsored rallies took place around the country Saturday to mark the end of the unrest that shook the country in 2009. State television reported pro-government rallies were held in about 1,200 cities and towns. 12/29/17 -- The White House strongly condemned the arrests in Iran of peaceful protesters, as reports emerged that more than 50 people were arrested for protesting in Iranian cities against the country's economic troubles. "There are many reports of peaceful protests by Iranian citizens fed up with the regime's corruption and its squandering of the nation's wealth to fund terrorism abroad," the White House spokeswoman Sarah Huckabee Sanders said. "The Iranian government should respect their people's rights, including their right to express themselves. The world is watching." In this photo taken by an individual not employed by AP and obtained by the AP outside Iran, university students attend a protest inside Tehran University while a smoke grenade is thrown by anti-riot Iranian police, in Tehran, Dec. 30, 2017. 12/29/17 -- The State Department said it urges "all nations to publicly support the Iranian people and their demands for basic rights and an end to corruption." 12/29/17 -- Iranians gathered for another day of protests in cities around the nation Friday, as people voice their displeasure with the country's economy and government policies. These demonstrations are seen as a cry against President Hassan Rouhani, who won re-election in May with promises to revive the economy.